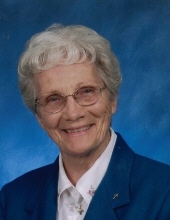 Doris M Clary, age 100, passed away peacefully on March 27, 2019. She was born on March 18, 1919 to Frederick and Rosina (Dieter) Swenink. She grew up on the family farm in Dieter Hollow, Richwood Township, in Richland County. On January 31, 1953 she married Keith O Clary and they settled in Richland Center. During her lifetime she was witness to a great number of things, including life on the farm during the Great Depression, which resulted in values that she lived her life by. In addition to being a homemaker, she worked for Clarson’s Ice Cream Plant, the Richland School District and The Richland Hospital. In her retirement, she and Keith spent many years as snowbirds in Arizona and Texas until Keith’s death in 1998. She is survived by one son, Frederick (Rita) Clary, sister-in-law Betty Swenink, nieces and nephews Karen DuBois, Kathy Huinker, Kevin Swenink, Sheri (Jim) Hawkins, Steve Swenink, Stuart Swenink, Bruce (friend, Deb Anderson) Swenink, Nora (Randy) Cowden, Iretta Love, Kathy Jo Anderson, Laura Jean (Fred) Peterson, Alan Louis, cousins and other relatives and friends. Along with her husband and parents, she was preceded in death by her brothers, Theron Swenink, Byron Swenink and Laurence Swenink, sisters-in-law Bernadette Swenink, Madeline Swenink, Agnes Clary, & Elsie Louis, brother-in-law Ira Louis, and nephews Otto Louis and Dave Huinker. Funeral services will be held at 11:00 AM on Tuesday April 2, 2019 at the Pratt Memorial Chapel with burial to follow in the Richland Center Cemetery. Visitation will be held on Monday, April 1,2019 at the Pratt Memorial Chapel from 4:00 PM until 7:00 PM and again on Tuesday, April 2, 2019 from 10:00 AM until the time of service at 11:00 AM. The family suggest memorials in Doris’s name be directed to Pine Valley Community Village. The Pratt Funeral and Cremation Service is assisting the family with their arrangements. Online condolences may be made at prattfuneralservice.com. To send flowers or a remembrance gift to the family of Doris M. Clary, please visit our Tribute Store. "Email Address" would like to share the life celebration of Doris M. Clary. Click on the "link" to go to share a favorite memory or leave a condolence message for the family.